Spooky Elegance is a great autumn stitch for those who love Halloween. A sleek black cat sits among the pumpkin patch while the bats fly in the night sky. 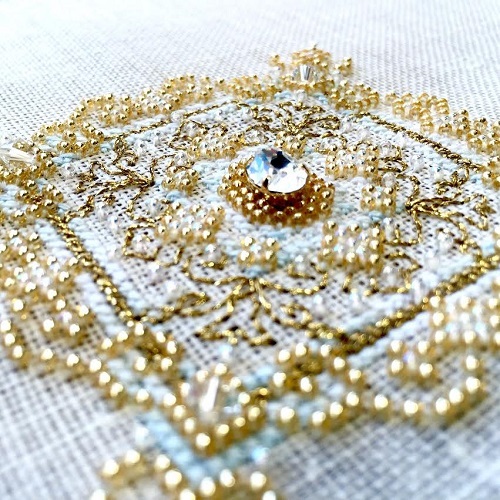 Cross stitch this design and make a gorgeous (and sparkly!) ornament for your Halloween decor and add a little touch of magic and elegance to your atmosphere this Halloween. The design measures 40w by 40h. The bead embellishment pack contains 8 Swarovski crystal bicone beads in 2 colours and enough seed beads in black and lime to complete 1 design.